Late last year CED Commercial Division won the order to supply a stone plinth for a memorial being erected by the charitable group, K9 Memorial UK. The charity was set up by Paul Nicholls a former police dog handler ho lost his canine partner Sabre to cancer in 2006. Paul was shocked to discover that the only memorial to commemorate the valuable role played by all the brave police dogs who had passed, was a plaque at the Police Memorial Garden in Staffordshire. 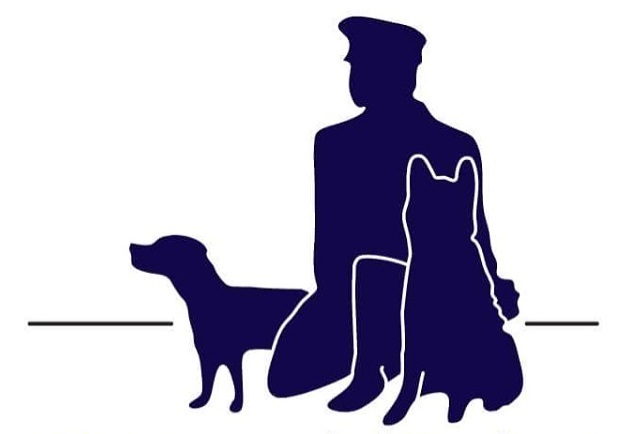 So Paul set up the K9 Memorial UK campaign to create a more fitting tribute for the unsung heroes of the police force. 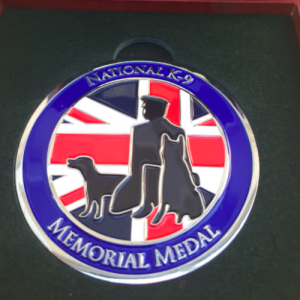 The charity also created The National K-9 Memorial Medal the first of its kind in the United Kingdom. This medal is available for presentation to Police Dogs upon retirement, or in recognition of their bravery. The planned memorial is a sculpture, which will be sited at dog-friendly Oaklands Park in Chelmsford. Essex. Artist and sculptor John Doubleday was commissioned to create a maquette of the design, a bronze statue of a Police Officer kneeling by a German Shepherd dog and a Cocker Spaniel, both based on real retired police dogs. 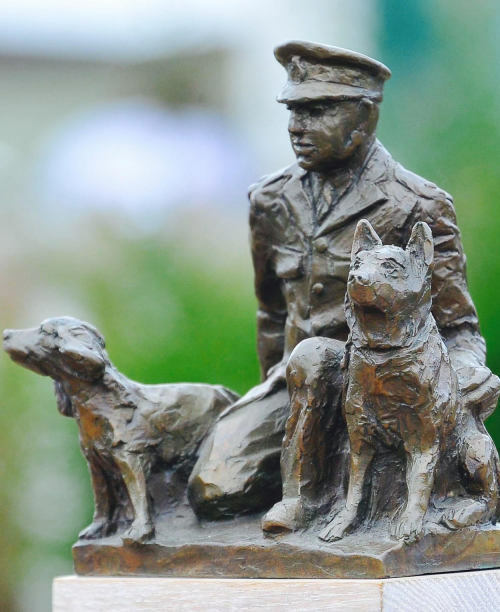 You can read about the fabrication of the sculpture on the K9 Memorial blog. We were contacted with regards to supplying a stone plinth for the sculpture to be mounted upon. Chairman Michael Heap took charge of this job, discussing material options with the artist, John Doubleday. The requirements were; the plinth was to be a cubic metre block, the stone was to be British, and that it must complement the bronze statue. After discussing the options, it was decided the best material for the job would be our Scottish Green Schist, a brand new stone product on the market sold exclusively by CED Stone Group. Using British Stone for jobs like these is most advantageous as if any issues with the statue were to arise which is not unusual in the process of casting bronze, and changes had to be made to the plinth, this could be done in a much quicker timescale than if the stone were sourced from Europe or elsewhere. 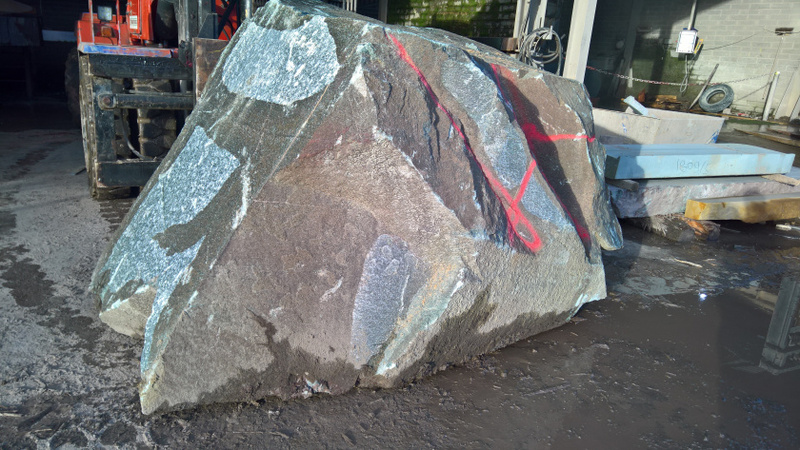 The plinth was cut from a large singular piece of schist rock (pictured) by our associates Tradstocks, at their masonry yard. 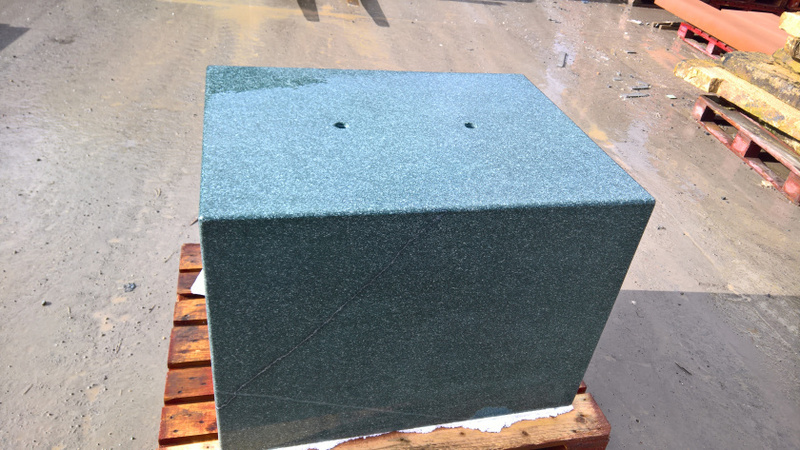 The cut block was honed on all surfaces, drilled on top for the sculpture to be affixed, and transported to our head office before being sent to have the sculpture mounted. The unveiling ceremony is being held in Oaklands Park on Friday 12th April at 2:30pm. Members of the public and police handlers along with their dogs are invited to join K9 Memorial UK for this momentous event. An exhibition is also being held on the day, showcasing how Police Dogs have developed in the UK since their introduction. We are thrilled to have supplied this piece of stone for such a special event and are very much looking forward to the unveiling. This memorial will stand as a mark of respect for the service given by police dogs all over the world, and we are sure it will bring comfort to those who have lost canine partners and companions.